How do I download the Squash and Stretch effect? Is there an effect for squash and stretch? How do I get my models to squash and stretch? 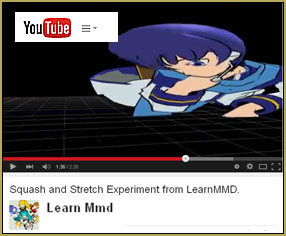 Can you do Squash and Stretch in MikuMikuDance? How to Use the Squash and Stretch Effect. Surprisingly enough it’s labeled “Squash and Stretch.” Click on the link and it will take you to a NicoNicoDouga page, which will give you another link and password. 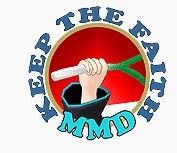 I realize that this has become a mantra, it is important to have MMEffects properly installed in MMD. Please see Noko2’s article on that It’s here: https://learnmmd.com/http:/learnmmd.com/download-mme-install-mikimikueffects-add-effects-mmd-7-39/ or this article by our fearless leader Reggie: https://learnmmd.com/http:/learnmmd.com/download-mme-v036-in-english/ Make sure you put this into your “Effects” folder. Now open up MikuMikuDance and load up your model and motion data. You will notice four items (a Read Me file, 2 FX files and a PMD file). You need to load up the squash and stretch effect onto your model. Many effects are loaded this way, if you are an ardent reader of our articles, then this should almost be routine for you. However, a review is never a bad thing. Go to your MMEffect button at the top right hand corner of your screen. Click on that and then select the Effect Mapping (M) option. Another window will open up, double click on the model’s name and load up the Squash and Stretch FX file. Now click the Okay button in the Map Effect window. Loading the squash and stretch controller is our next task. It is listed as the SQUASH AND STRETCHControl pmd file, so it’s loaded up through the Model Manipulation Panel (MMP). Controlling the squash and stretch effect is done in the Facial Manipulation Panel (FMP). You can create and assign original motion data for one axis or all three axes. Distortions and Contortions with Squash and Stretch. The Squash and Stretch Effect can add a whole new cartoon like dimension to your animations. So let your imaginations go amok, and play around with this effect. Imagine a scene where two characters that are mad at each other, enter a house and close the door. Applying the Squash and Stretch Effect will show the house twisting and distorting with their fight inside. Squash and Stretch Effect by豊作P. l’effetto non è più disponibile. che sfortuna e io che lo cercavo da + di 5 anni. qualcuno sa aiutarmi? grazie in anticipo. Is there a way to localize the effect? Lets say if Rin hits Len over the head with the squeaky mallet of death only Len’s head should squash. and not his whole body. It’s limited though. I was torturing Kaito again as research for this question (Hehehehehe). Load the effect on the model as you normally would in the article. You would have to take an extra step and use the subset extract feature to remove the effect from the model parts you don’t want affected. Just click on the subset and click the Remove Effect button. So at the end of it all you’ll just have the effect listed on the model’s name and the subsets you chose. Also keep in mind that ALL the subset parts will be affected.